There are many books of poetry out there today—the range is staggering—from simple lyrical collections to obscure works difficult for readers to access. 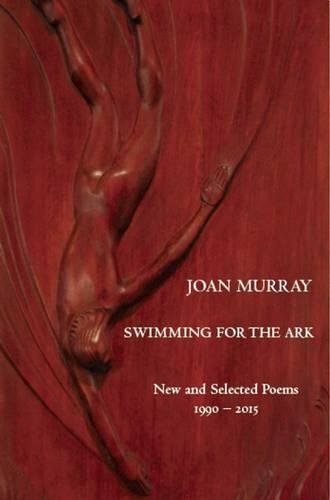 Joan Murray’s new book, Swimming for the Ark: New and Selected Poems 1990–2015 hits neither of these poetic edges. What it does is lay out a collection of new and previously released poems that uncover the author’s masterful use of narrative and lyrical forms to bring out the taste, touch, feel, and memory of real life experience. Throughout her collected New Poems in the manuscript, Murray hits the reader with her best work, exemplary poems that bring the reader into the topics she shares, that reveal both macro and micro views. But readers are treated to much more in this book. It is filled with choice selections from Murray’s previous collections: The Same Water, Queen of the Mist, Looking for the Parade and Dancing on the Edge. There is much a reviewer could say about these collections—how the author uses narrative to draw readers into her narrator’s view, how Murray uses lengthy, segmented poems to effect in The Same Water, how Queen of the Mist joins a collection of poems to tell the story of traveling over Niagara Falls in a barrel, how she deals with beauty and sorrow and daily routine in Looking for the Parade and Dancing on the Edge, but I think the reading of her poems will say much more. Swimming for the Ark succeeds where many other books might otherwise fail—it draws the reader into an age, a view, a slice of life and it delivers substance through well-built structure and a careful choice of language. Once I cracked its covers, I did not want to put this book down. Neither will you.